Selection of New 2015 Wallpaper Books – available at 20% off! | Alcher Interiors, Inc.
From April 20th thru May 1st, 2015, we’re offering a 20% discount off of paper selections from three great new design books, which just arrived. 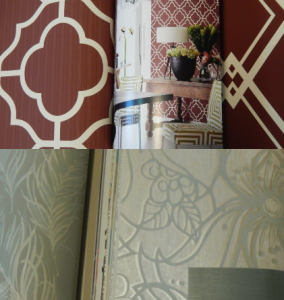 Pantone’s color of the year – Marsala – appears in several patterns in the new wall paper book “Indigo” by Printers Guild. Also just arrived, THE PAPER MUSE COLLECTION by Stacey Garcia and GATSBY by Seabrook. Stop in and check out some of the newest styles and palettes appearing for this summer! The 20% off offer is valid April 20, 2015 through May 1, 2015.